Preparing for IAS/civil services have become the top priority for the current generation students after completing their degree. For some students, it's the only option left due to the increasing unemployment rate within the country. But clearing the civil service exam isn't a task that anyone can achieve overnight. For that months or years of preparation is needed. Moreover, clearing IAS exam is impossible without the aid of any reputed coaching centers or at least without the help of a pile of costly books and guides. However, today students try to make use of technology in the form of different informative blogs or websites rather than depending on those costly books. But which website or blog will you follow? If you open the internet and search for an informative site, you'll end up with depression as none of them will give you the complete information that you need. This will cost you lot of time and effort. You as an IAS/Civil services exam aspirant might also be wasting your valuable time browsing website searching for free materials, classes, and notes for supporting your IAS exam preparation. With the below list of best IAS preparation apps, you can save all those time and rely on just one or two apps. Where you'll get everything you want at one place. Well, with our technology being advanced we today can get anything from anywhere at our fingertips within seconds. Today in this article let's find out how some of these best free civil service apps can help you achieve your dream by cutting down your time and effort and most importantly saving thousands of your money. In the list of best civil services app, IAS UPSC by Civilsdaily comes first. This app is one of the best GK/current affairs app out there on the market. IAS UPSC is not only useful for IAS aspirants alone but also is the best choice for those who're preparing for other competitive exams like Bank PO, IBPS, SSC and even GATE. Features like a definitive summary of all the news roundup, available in office mode etc. really help a candidate in cracking the IAS exam. One of the most important field to be proficient in order to crack the IAS exam is none other than current affairs and the best way to collect them is via reading news editorials. 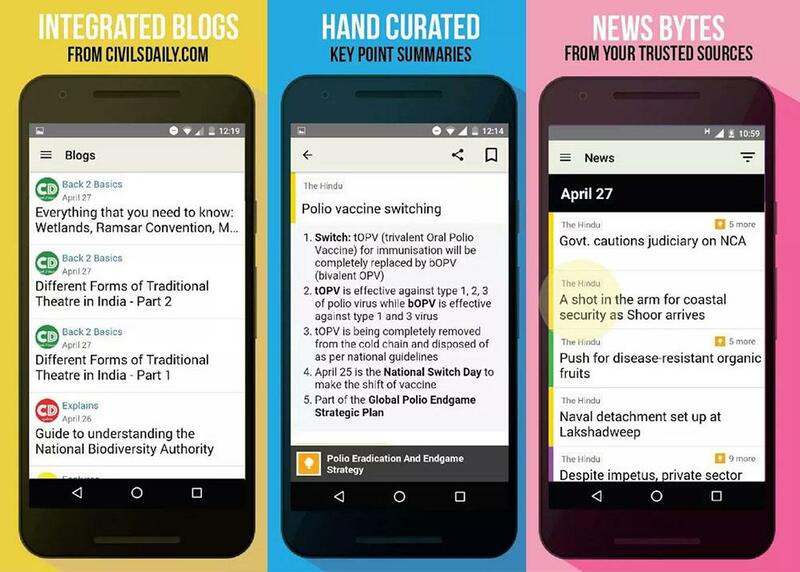 With this app, you don't have to take effort in collecting editorials of different newspapers. Gists and essays of an article from Yojana, Kurukshetra, PIB etc is also an added feature of UPSC. 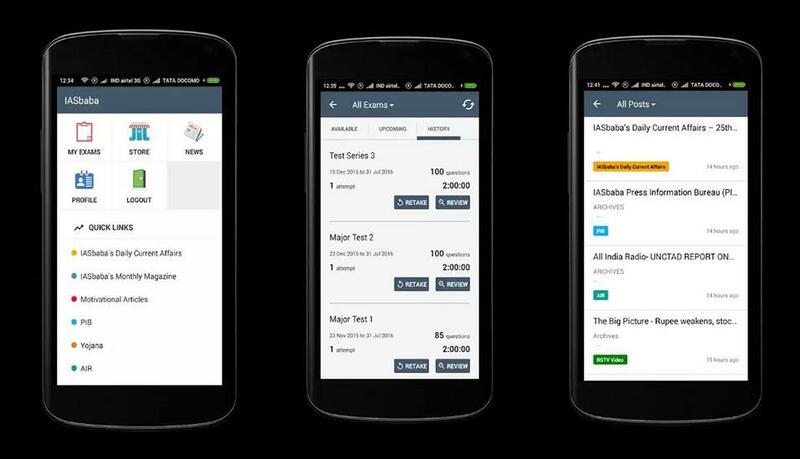 Moreover, lecture videos related to IAS, UPSC & other competitive exams, quizzes, and tests services are also included in this IAS preparation app. With over one million downloads and 4.8-star ratings from 59 k users, this learning app from Unacademy is something that you never should miss. Unacademy if one of India's largest free education portal with over 5 lakh students and over thousands of lessons to choose from. 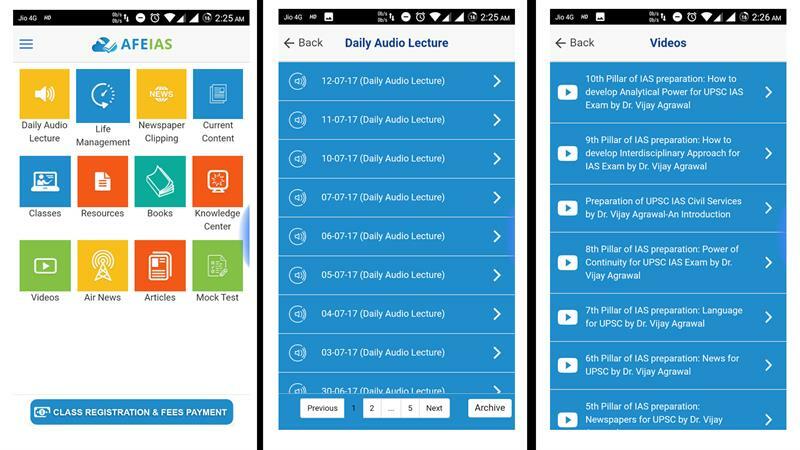 With this app, you get a chance to access free lectures from India's top educators. From UPSC, SSC, CAT etc., the list of courses delivered in this app is numerous. 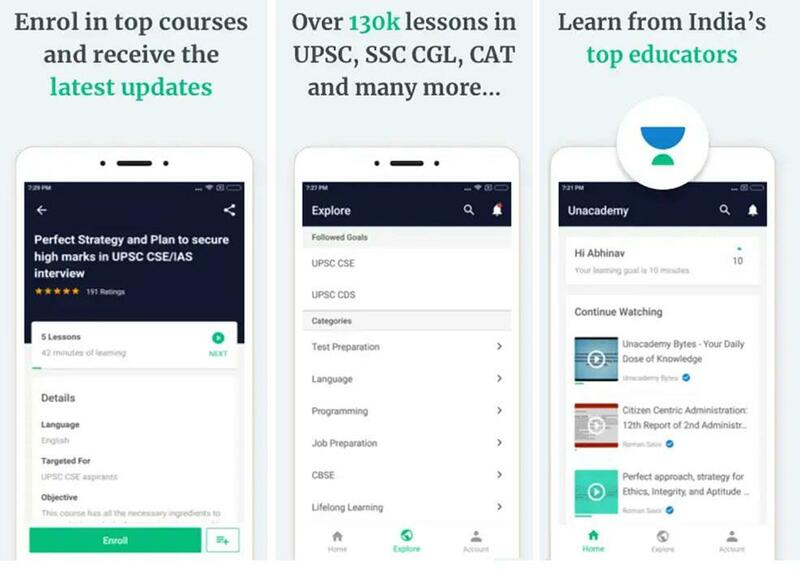 As a possible learner, you can really benefit from Unacademy learning app and you'll be able to crack various competitive examination with the help of this platform. Vision IAS is yet another brilliant app from vision IT Labs with a whole new list of features to deliver. This app helps its users achieve best results in UPSC/IAS exam. One of the best features of vision IAS is the online access to old video lectures or the live sessions. For getting more from it, vision IAS also allows users to interact with the teachers and clear their doubts. Here in this app, you can also get all the study materials provided by the team. 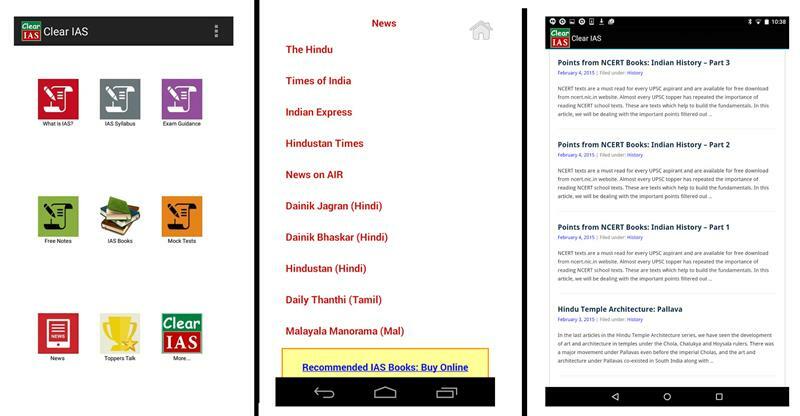 Yet another useful app for every UPSC/IAS aspirants to try is the IAS baba. This is a great app that provides rich and quietly materials in a simplified manner. This helps the student learn current affairs more easily. By creating an account on IAS Baba you'll be able to enjoy various features like attending mock tests, various discussions from all India radio & RSTV Big Picture, PIB, Monthly Yojana, Current affairs and more. As all the above-mentioned apps, Insights on India is also a very good IAS preparation with lots of available features that will help you simplify your civil services exam preparation. 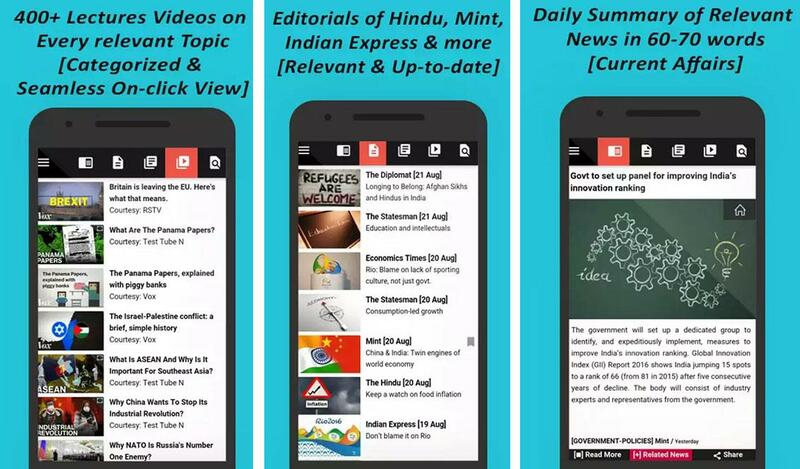 The mentionable features that come packed with this app are: Editorial gists, daily current affairs with online quiz, mind map, articles and various other tips and tricks to crack your IAS exam. Here is yet another great app for all those UPSC IAS Civil service aspirants. Like most of the above-mentioned apps. AfeIAS too delivers lectures from skilled faculties who are either former civil servant or authors of different books like Dr. Vijay Agarwal who have written: "How to Become an IAS". Moreover, with AfeIAS you will also get to enjoy a list of various features including Daily audio lectures, Newspaper clippings, Current affairs, Life management audio, video contents, mock tests and more. Apart from that, the users will also get access to all the NCERT books from class 6 to class 12. 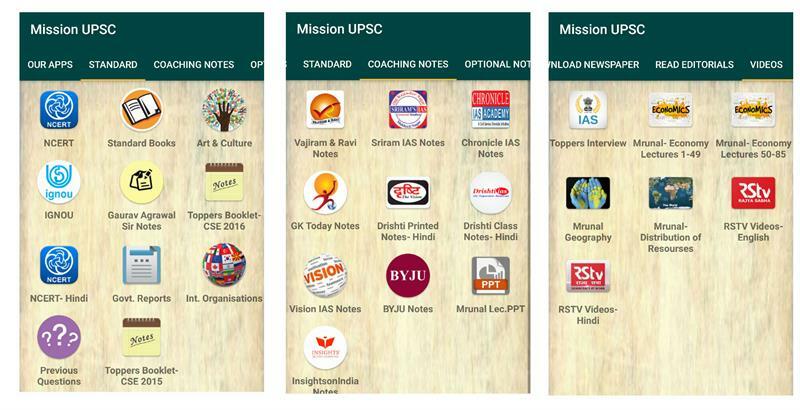 If you are looking for near perfect app that includes most of the demanding features from all the above-mentioned apps, then I would suggest you check out Mission UPSC app. 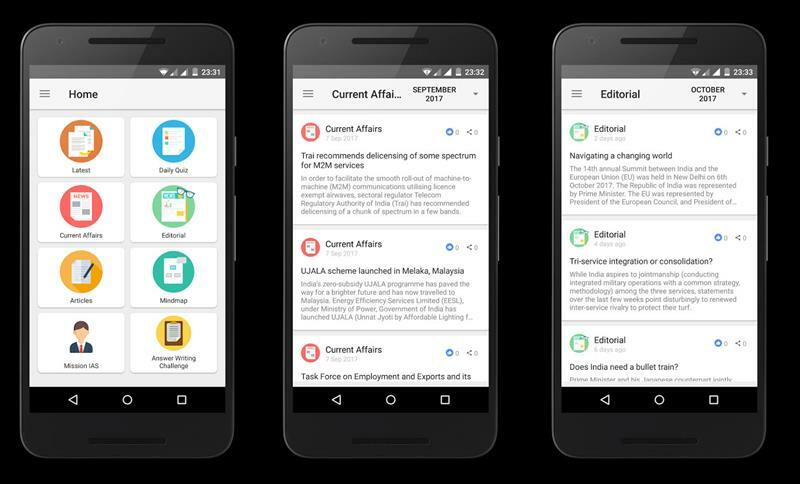 With this app, you get almost any features that a UPSC/IAS exam aspirant ever want in a mobile app. Mission UPSC provides almost all UPSC related books and notes. The never-ending list of features also includes previous year questions quiz, NCERT books, And Political science etc. Clear you our IAS exam with the help of ClearIAS app by preparing for your exam online. This app provides a complete self-study package for IAS exam preparation. Different online programs provided by ClearIAS will help you clear your prelims mains and even interview. This app will also help you make your learning simple and faster with all these study materials, lectures, notes, quizzes and mock tests. Apart from these ClearIAS also opens a platform to shop the recommended IAS exam preparation books online. Also, the toppers interviews will help IAS exam aspirants in many and help you in preparation strategies. Although there are dozens of apps in the market for clearing UPSC civil service exam, above mentioned are the best that I find helpful. It is recommended to use and follow only one or two apps, as using multiple apps may negatively impact your productivity an could also lead to information overload. I hope you find this article helpful and I wish you every success for your journey to civil services. Online learning has opened doors to education for people from around the world. Many e-learning websites have now started making Apps to get their content accessible on portable devices. In this article, we are listing some of the open learning college education apps for Android platform. Mathematics is the most boring or scary subject for most students. But let me tell you that mathematics is the most beautiful and interesting subject out there. You just need to study it in the right way. I have mentioned some Android applications in this article that can improve your mathematics like never before. Read on to know more. PhotoMath Camera Calculator review: Making Mathematics Easy? Are you looking for an app that can solve the mathematical problems in shot? Here's an app that sounds quite interesting and claims to solve math problems simply by taking a snap of the problem. Would you give it a look? Please dont approve this comment. Can you put the Oliveboard App to post. India's largest and most quality mock test app.